Return of the Trades House Curling Trophy to the Merry Masons after 53 years. The Masons, skipped by Doug Kerr with Iain Smith at three, his brother Gavin at two and lead Stuart Pollok had a notable win over the Bakers in the final of the Trades House Curling Competition at Braehead on the 11th of March 2013. The Bakers were skipped by Graham Davidson with Allan Winning at three, Simon Blyth at two and Fraser Davidson leading. For Mason Skip Doug, it was a particularly meaningful victory, as his father, the late and redoubtable Willie Kerr, had been in the team that last won in 1960. A further detail more than worthy of note was that Deacon of the Masons Brian Evans shepherded his team through to the final, but had to withdraw from the last match due to an injury, when lead Stuart stood in for him and led the Merry Masons to victory. It was a close run thing with the Masons winning 5 to 4, and the spectators were on the edges of their seats throughout. 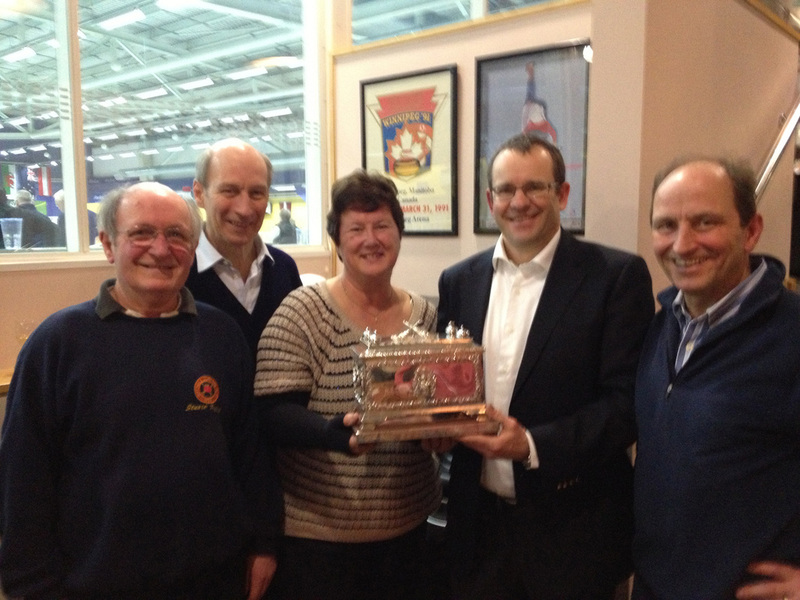 Helen Burton, the wife of the Curling Convenor, presented the handsome Silver Cigar Box Trophy to the elated victors. The Incorporation of Masons is one of the very few crafts whose team is always made up of members of the Incorporation. The well-known oldest Past Deacon of the Incorporation of Masons, James Hamilton Smith will be delighted at this victory for two reasons: firstly James Hamilton Smith was the Curling Convenor for many years and secondly, two of James’s sons Iain and Gavin were members of the winning team. All members of the Incorporation of Masons send warmest Congratulations to our victorious team and hope that they retain the trophy for at least a few years to come. It is appropriate to remember the great game played by the Bakers and to wish them all the best wishes in next year’s matches which will start in October 2013.